Someone started a Facebook event proposing a pro-Bernie Enough is Enough rally in Washington D.C. Their goal is 100,000 RSVPs before they bring the idea to the official campaign. Guess what? It has 45,000+ RSVPs, and the Sanders campaign has officially expressed interest. THIS COULD HAPPEN. On the same day as Katy Perry is doing a concert for Hillary Clinton, two left sharks for Bernie Sanders. OP wants advice when girl he's dating asks if he's seeing anyone else. Commenter looks through OP's posting history and finds posts in /r/theredpill where he sounds like a completely different person. OP tries to downplay his association with this subreddit and fails miserably. There is a shift in the recent PPP poll relative to last month that no one is talking about: Bernie's favorability among African American Democratic primary voters increased by 17%. His unfavorability among the same demographic decreased by 21%. A student from Liberty University endorsed Bernie Sanders for President on the campaign Facebook page. This is one of the co-founders of #BlackLivesMatter chastising the Clinton campaign for claiming it met with them when they apparently haven't. In the comments of the post, she notes that the Sanders campaign has been much better in its attempts to reach out. A Bernie poster I made that channels a comparison more and more people are making. Another person comments on Correct the Record's Facebook page to indicate they are switching from Clinton to Sanders due to the Super PAC's attacks on Sanders. My GF's mom's dog keeping watch over the neighborhood. As of right now, there's no volunteer work (purple) or volunteer events (green) scheduled through the berniesanders.com website in South Carolina. Only the official campaign events (red) this week appear, including the opening of a campaign office in Columbia. This needs to change soon. A PolitiFact post from July has a table containing all of Bernie's key votes on guns from 1993 to 2013. For those who don't really know his record on guns, or for situations where someone is distorting his record on guns, this is pretty useful. United States Attorney General Loretta Lynch, everyone. A shot of the crowd in Phoenix was just posted by the campaign on Bernie's Facebook page. Regarding Jeb Bush's suggestion to phase out Medicare. A reverse seared filet mignon. The inside was evenly cooked, and the crust was delectable. A knob of butter gave it a tantalizing sheen. It was delicious. Correct the Record is the name of the Clinton Super PAC that attacked Bernie Sanders. The attack was a tactical error, as it runs the risk of alienating the progressive Democrats who are supporting Hillary Clinton. Want proof? This was a comment left on their Facebook page. Got tired of flash videos auto-playing on various sites, so I employed this fix (Chrome). Bringing back Life Hack Loon. No premium cuts or fancy preparations this time. Just a sirloin and a really hot cast iron skillet. Turing Pharmaceuticals CEO Martin Shkreli declared he was so angry at Bernie Sanders that he could punch a wall. Then he posted an x-ray that was allegedly of his wrist. But a Google search for the image of the x-ray shows it's not his x-ray at all. This is why I'm 100% behind Bernie. Because he is 100% behind the principles he espouses, and he wants the grassroots movement behind him to emulate that behavior. Made a new pro-Bernie poster that emphasized one of the themes from last night's speech in Portland: the establishment does not share the priorities of the middle class. American Family Radio host Bryan Fischer offers a rather nuanced perspective on today's Supreme Court ruling. Reverse seared filet mignon with balsamic caramelized onions. Minimal gradient this time. Was trying to make a web poster that details information for upcoming events, including media quotes that highlight its potential size. It's meant to be shared with the accompanying RSVP URL. Let me know what you think. Took my first stab at designing a pro-Bernie poster. 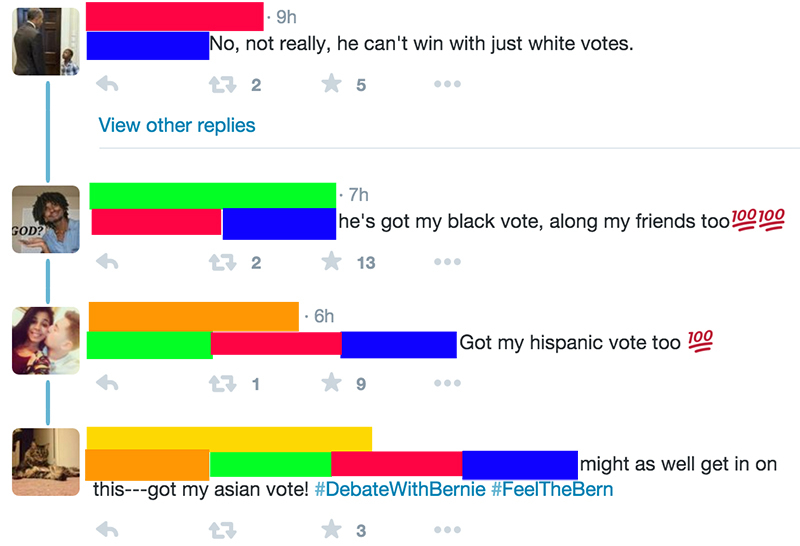 This is pure fluff, but someone on Twitter posted how Sanders can't win with just white votes, and the response made me smile. My second attempt at a reverse sear. Method used for this 1-3/8 ribeye: bake until internal temperature is 110˚F, rest five minutes, sear each side for 45 seconds in really hot cast iron skillet, slice and serve immediately. Rubio and Cruz have both missed quite a few votes while they've campaigned for President. In 2008, Obama, Clinton, and McCain also missed quite a few votes. Sanders has barely missed any.